When Emma Woodhouse, the spritely 21-year-old protagonist of Jane Austen’s 1816 classic novel Emma, delivers the above judgment, she’s deciding to tolerate a friend who’s just traveled 16 miles to London to get a haircut. Such a long trip for so little payoff seems like foppishness and vanity to Emma, who is shocked when the friend, Frank Churchill, returns “without seeming really at all ashamed of what he had done… quite as undaunted and lively as ever.” But after pondering his self-indulgence, she decides she can excuse it because Frank is otherwise a relatively grounded gentleman, and because at least he isn’t bragging or awkward about such a massive offense to propriety. There’s a lot of comedy packed into this little moment—in Emma taking such a proprietary, offended interest in Frank’s haircut; in her believing she needs to find reasons to pardon him; in the fairly ridiculous mental workaround she uses to decide she can accept his trip; and in her getting huffy over him going to London in the first place. (There’s even an extra layer of irony in that all her fuss is misguided; he’s actually on another errand she doesn’t know about, and the haircut is just a cover story.) As the only remaining resident daughter of a prominent land-owner in a country village, Emma is one of the most socially important aristocrats in her little community, and she lets it go to her head, deciding she’s far more mature and responsible—and far less naïve and arrogant—than she actually is. But while she would never acknowledge it, her philosophical treatise on Frank’s behavior could be applied to her as well: There’s plenty of folly in her attempts to play matchmaker in her community, but her actions never seem silly, because she goes about them with such good will, and so playfully. Emma is a comic novel, but the humor isn’t at Emma’s expense. The funny thing about reading Austen’s Emma shortly after revisiting Clueless in seeing how profoundly similar they are. The plot beats are roughly the same, albeit with significant alterations to account for their eras—in one of the broadest interpretations, a sheltered young woman terrified into incoherence by a band of importunate, begging “gipsies” becomes a character who earns brief popularity after a couple of horseplaying teen boys briefly dangle her over the second-story railing at a mall. But more significantly, both stories are about the same kind of people, in the same kind of environments, approached with the same sort of satirical winking. The country village of Austen’s novel is small enough to only house a handful of prominent land-owning families who consider themselves close enough on the social scale to make associations proper and viable. They form an insular little circle, spending all their time visiting each other, writing letters back and forth, planning group amusements, and gossiping about each other. While a handful of them have traveled further afield—to London for visits, or to Bath for their health—they’re all inextricably caught up in and defined by their immediate community. (Again, this story takes place in an environment where Emma thinks it’s impossibly self-indulgent to travel 16 miles without significant cause.) When Emma loses her former nursemaid and current companion to marriage, they stay best friends, their homes are only a short carriage ride apart, and they see each other daily, but Emma still mourns the loss of a live-in friend on her estate as if the newly minted Mrs. Weston had died, rather than moved up the road. When Emma befriends beautiful but penniless outsider Harriet Smith and decides to find her a higher-class husband, she can’t look outside her own limited social set, so she settles on an inappropriate match with the handsome, proud vicar Mr. Elton. When Mr. Elton spurns Harriet, leaves town, and comes back engaged to a boorish outsider, all the characters heave an inward sigh, knowing there’s no escaping constant contact with the new arrival. Conversely, the arrival of Frank Churchill—another outsider, but a dashing, entertaining one with local family ties—energizes the entire community. And when Emma falls in love herself, naturally it’s with her family’s oldest, closest friend and nearby neighbor, Mr. Knightley. Clueless’ brilliance as an adaptation comes from the way Heckerling saw how precisely Austen’s country village parallels a modern-day high school, another environment where a small group of people are tied together by circumstance in a social setting where class and personality creates artificial rifts, nearly impenetrable except when the participants see some benefit in penetrating them. Without making a show of it, Heckerling is awfully clever about finding specific situational equivalencies, like the way Emma deigns to attend a party thrown by her social inferiors because all her intimates will be there and she doesn’t want to be left out, while Cher reluctantly agrees to venture outside safe, posh Beverly Hills because “the whole crew is going to this party in the Valley.” Or the way Cher’s bestie Dionne (Stacey Dash), like Emma’s Mrs. Weston, is still constantly available to Cher, but seems just a little less devoted and simpatico once she loses her virginity. Or the way Frank is flirtatious but coy with Emma because he’s covering up his secret engagement, while new-to-town pretty-boy Christian Stovitz (Justin Walker) is flirtatious but coy with Cher because he’s covering up the fact that he’s gay. But while Clueless follows Emma on a point-for-point basis, its biggest similarities are still environmental, in the way the insular aristocrats of a small, wealthy village mirror the spoiled, perky kids of a Beverly Hills high school. Both groups are so locked into their socially hermetic whirl that the arrival of a new face is cause for huge excitement and endless entertainment. Both groups are obsessed with gossip, hungry for novelty, and deeply focused on the rare formal dance that makes the same old faces and relationships feel fresh again. And both groups take their hookups and split-ups extremely seriously, never realizing that their authors are openly making fun of them. There’s no malice in the satire of Emma or Clueless; both stories are affectionate about the social circles they travel, but they’re also both aware of those circles’ flaws. Austen gets her version of snark in through endless scenes where tiresome characters—Emma’s stick-in-the-mud father; trivial yet talkative spinster Miss Bates; Mr. Elton’s puffed-up new wife—drone on at great length without communicating anything worthwhile. Even the most dynamic characters engage in long, empty, fencing conversations about nothing. Austen occasionally directly says that all the polite, banal upper-crust English chatter is tiresome, but more often, she puts it on the page at length, to amuse her exasperated readers. Clueless directs its snark more at Cher, who’s so sheltered and inexperienced that a brief, accidental moment of driving on the big, scary freeway counts as, like, a major life trauma. (“Boy,” she thinks afterward, “getting off the freeway makes you realize how important love is.”) This is a girl who, chastised about not contributing enough to society, proudly proclaims “As soon as I get my license, I fully intend to brake for animals!” Asked about significant happenings in school on a given day, she muses, “Well… I broke in my purple clogs.” Where Austen satirizes the stiff and meaningless forms of her society, Heckerling snickers at teenagers’ self-absorption, self-righteousness, and cluelessness. But both creators are still kind to their creations: Their trials are small, their comeuppances are minor, and they both end in happy places. They’re foolish, but they aren’t wicked—they’re just doing silly things in impudent ways. As Heckerling was making Clueless, another writer-director was working on his own Emma adaptation. Douglas McGrath’s Emma, starring Gwyneth Paltrow as Emma Woodhouse, came out a year after Clueless, and reclaimed the story for the 19th century. It follows the literal details of Austen’s book, using her dialogue, character names, and story specifics, and paying a great deal of attention to the scenery, accoutrements, and clothing of Austen’s era. But strangely, it feels like a less-faithful adaptation, because it’s so artificial and mannered, and because it’s off-base in so many tiny details. Austen’s book is about a sweet, self-possessed young woman whose vanity leads her to interfere in other people’s lives, but whose innocence leaves her relatively blameless, especially when everything works out well in the end. Heckerling follows suit. But in Paltrow’s hands, Emma doesn’t seem young or innocent, so much as contemptuous and superior. When she dismisses a well-written offer for Harriet’s hand in marriage (“It is a good letter. One of his sisters must have helped him.”), she sounds as snide and resentful as Austen’s sort-of-villain Mrs. Elton. Mock-praising Mr. Knightley for arranging a ride for Jane Fairfax, who plays the pianoforte better than Emma, Emma sounds downright bitchy. (“How sweet to have lent your carriage to her, so that her fingers would be warm enough for the performance.”) She doesn’t come across as naïve so much as catty, petty, and jealous. When she assumes Frank Churchill is in love with her, she adds smug and insufferable to the mix; when she alternates grousing to Harriet about Mrs. Elton with bright greetings for other people around her, she seems two-faced as well. Austen’s Emma has some growing up to do, but Paltrow’s needs a full personality transplant. And while each of the three versions have their own version of artificiality, Clueless and its source material seem more aware and deliberate about the satirical value in conscious fakery. Emma the novel gins up romantic misunderstandings and hollow, bantery conversations; Clueless is presented in wall-to-wall Fresh Prince Of Bel-Air-era eye-searing fashions and fake slang. Both creators are poking fun at their eras’ art: Austen at stuffy contemporaneous novels, Heckerling at 1990s fashion and style. But the 1996 Emma seems to take itself dreadfully seriously, even as the actors are giving broad, emphatic performances underlined with bombastic music cues and a lunging camera. (Ewan McGregor says his clumsy performance as Frank Churchill is a career-worst, and it’s hard to argue, while Toni Collette’s clumsy dopiness as Harriet robs her of every sympathetic aspect Austen described.) McGrath is so determined to wedge in as much of the book as possible that he slices out all the nuance, so characters who discreetly withhold every thought and emotion in the book core-dump them on each other in the movie, in a flood of rushed exposition. Meanwhile, he creates gags by cutting rapidly between scenes to create jokey, ironic juxtapositions. He presents Austen’s book with such leaden literalness that it feels less faithful than the version set in a time and place Austen never could have imagined. None of the three versions are actually about how real people lived in their era. Austen invents an aristocratic life of leisure where tedium, repetition, and snobbery are funny rather than stultifying, and everything works out in the end. Heckerling invents a tempting fantasy version of California where everyone’s rich and even the mean girls are largely defanged and benevolent. McGrath invents a falsely mannered version of history where everyone was genteel and bloodless, speaking in bon mots delivered with heightened, decorous precision. All three creators are inventing aspirational fantasies, romanticizing their worlds to make them fresher, funnier, and more alluring than their real-life equivalents. But from the perspective of nearly 200 years after Austen wrote Emma, it’s remarkable how many people have tried to adapt her work without understanding it as well as Heckerling does, or finding its core as adeptly as she did. The most loyal adaptation isn’t necessarily the best, if it doesn’t get the intent right, or embrace the kind of creative spark that the original work found. As Emma herself realized, a certain amount of playfulness goes a long, long way. Our Movie Of The Week discussion of Clueless ends here. 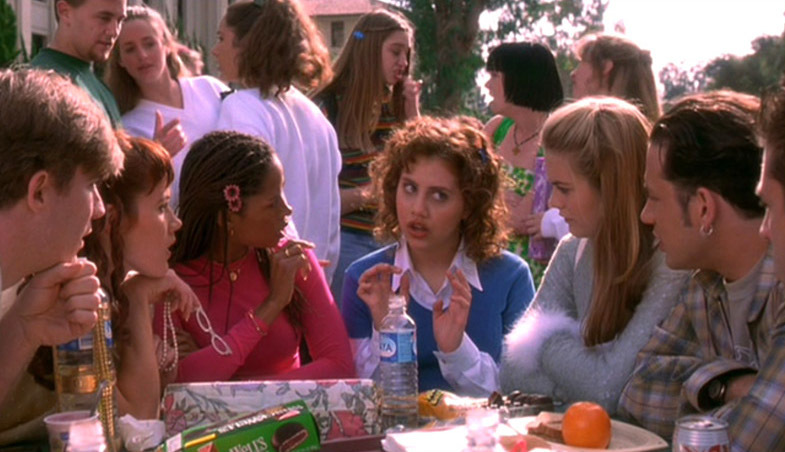 Don’t miss Tuesday’s Keynote on the “way normal” life of Cher Horowitz, and Wednesday’s staff forum on the movie’s all-star cast, endlessly quotable script, and time-capsule specificity. And don’t miss next week’s discussion of Mary Harron’s shrewd adaptation of Bret Easton Ellis’ American Psycho.